Strategic account managers ensure the strong communication between the organization and its clients. There are many duties assigned to these professional individuals. Like every professional person, the strategic account managers also get many job opportunities. In such a situation, a strategic account manager has an obligation to write a resignation letter to clearly state his/her decision of leaving the job. A resignation letter is a formal short written form of a document that informs your employer about your decision of leaving the job. No doubt, a good resignation letter paves the ways for you to a successful career. A resignation letter is usually written to the Human Resource Department or to the supervisor of the company. The best and polite way to write the letter is to include a notice of 2 weeks or a month as per your contract with the company. Moreover, it should also be kept in mind that resignation letter is not a suitable place for criticizing the company or including the complaints about the work situation or about the co-workers. Adding such things in the resignation letter should be avoided. 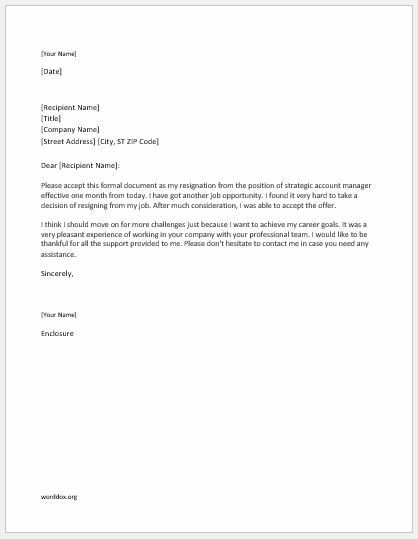 Here is a sample resignation letter for the post of strategic account manager that can be reviewed by you for getting the better idea about writing resignation letter from the employment. Please accept this formal document as my resignation from the position of strategic account manager effective one month from today. I have got another job opportunity. I found it very hard to take a decision of resigning from my job. After much consideration, I was able to accept the offer. I think I should move on for more challenges just because I want to achieve my career goals. It was a very pleasant experience of working in your company with your professional team. I would like to be thankful for all the support provided to me. Please don’t hesitate to contact me in case you need any assistance.